Guaria de Osa's main lodge is called the Lapa Lapa Lodge, named after the majestic neighborhood Scarlet Macaw (Lapa) that reside permanently on our beach. Surrounded by exuberant botanical gardens and a pristine rainforest and beach environment, the Lapa Lapa Lodge is a unique feat of architecture. 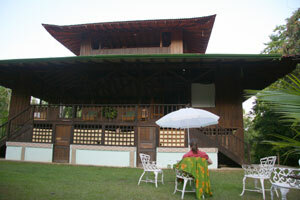 The lodge is a three-storied 36 foot high structure. Overlooking the palms and gardens the first two floors are 35 x 50 feet (10 x 15 meters) in size with a combined floor space of over 3500 square feet. Its observatory and meditation cupola, on the third floor, offers a panoramic view of the sparkling Pacific Ocean and Rainforest clothed ridges. The first floor is set up on a raised rock wall running the 50-foot span of the house. It has a 13 foot (4 meters) high ceiling suspended by majestic Manu wooden pillars. Its tiled floor, trimmed with ornamental patterns and delicately made mosaics and rugs create a sublime environment. A tiled counter, sink and stove top, is present for tea and guest use. 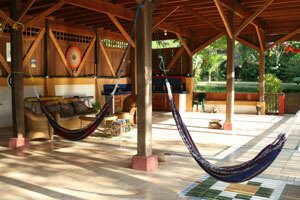 Hammocks and comfortable rattan furniture offer an ideal place for workshops, creativity, simply a place to come together where people and nature harmoniously join. with Punta Campanario clothed in forest jutting out onto the water, Veinte Minutos a small rocky island outcropping, looking like a mythological bird ready to take flight, in the West and the Caño Island - Oceanic Reserve in the background provide breathtaking views. Bird watching is spectacular from here as well; Toucan, Scarlet Macaws, the White Hawk and myriad more bird species often perch on nearby trees. Large Iguanas can be seen sunning on the branches of the neighboring Ekeme tree whos leaves and peach colored blooms they eat with delight. An alter to Kuan Yin, the goddess of wisdom and compassion helps channel ones energy offering a place of serenity, quietude and reflection for guided and self meditation. Here each sunset view is a gift to behold, the Ylang Ylang trees which flower all year long fill the dusk air with fragrance as the sky and water glisten with color and light. The Lapa Lapa Lodge harmoniously brings together conjoining aspects of traditional Amazonian and classical Oriental architecture. Its rising cloudburst eaves and three storied structure combined with its fanned rafters and large open central space symbolically represents the harmonious coming together of important world traditions from the Eastern and Western Hemispheres of the globe. 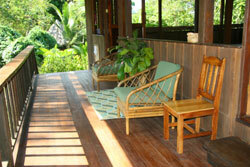 The Lapa Lapa Lodge was designed taking in to considerations all elements of our environment. Its high ceilings let hot air rise creating a cool and pleasant refuge to escape from the mid day tropical heat. The Lapa Lapa Lodges long and extended roof eaves also shade and cool the house during hot summer days while keeping the interior dry from the torrential down pours throughout the rainy season. The high ceiling allows for large open windows and the raised eaves grant unobstructed and spacious views. From a hemispherical perspective, Guaria de Osa is situated in close proximity to both the Caribbean and Pacific Oceans in the peaceful country of Costa Rica, the balanced place and geographical link between North and South America. These elements alongside many more create an ideal location for the bridging together of Eastern and Western cultural beliefs, spiritual views and practice. Throughout the entire building process tremendous effort was invested to ensure environmental sensitivity, which is of critical importance to us. Over 95% of the timber used to construct our lodges has come from old fallen trees laying for over 25 years in cattle pastures in the settlement of Los Planes. 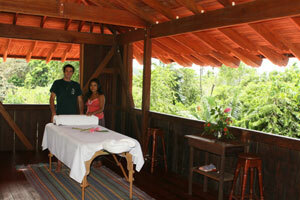 The lodges remarkable main pillars all came from a huge Manu tree fallen in a windstorm. The massive trunk was leaning against a cliff face curing since the1970s. All the wood was milled on site and brought in by oxen teams and horses from as far as two hours away. Hundreds of bags of cement, thousands of floor and ceiling boards and over a thousands bricks were brought in by boat, unloaded on peoples' shoulders and carried onto the site! The entire building has been earthquake retrofitted as well. 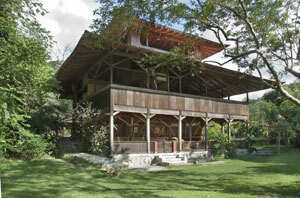 The architectural design has met safety specifications and has been approved by a re-known Costa Rican architect.